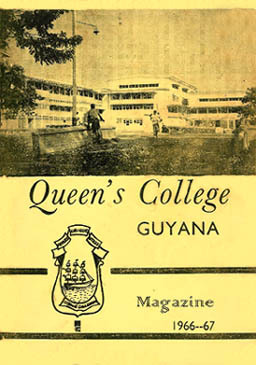 Five years ago, the Editor of our School magazine commented on the role that Queen's College was playing in Guyana at that time, and he stressed the fact that with the attainment of our country's independence, out task would be in no way alleviated, but insisted we would have to put our shoulders to the wheel and pay no heed to the down-trickling perspiration. Today, it is with much pride and satisfaction that I write this Editorial, the second one written for our Magazine since our country achieved its independent status. Queen's Colelge, by her consistent winning of almost all the external scholarships, by her continuing to produce men of both brawn and brain, has effortlessly managed not only to to hold the responsible positions in our country, but to show signs of sustaining this trend in years to come. We have recently heard of our boys representing the country in Athletics, Football and Cricket, and of our boys' fine display in local Table Tennis Tourneys. We have heard of our Old Boys who year after year, graduated fromUniversities throughout the world. 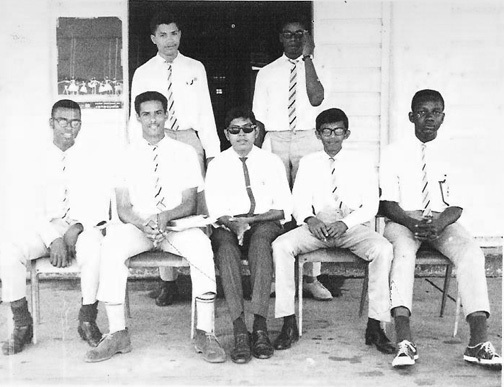 We have heard that over sixty percent of teh Officers of the Guyana Defence Force are old boys of Queen's College, and we have also heard how Queen's capably held her own in the last Music Festival. It is these glories, triumphs, and achievements which our School has secured in the past and is now securing day by day, that have boosted our name throughout the recognized educational circles of several lands. So, gentlemen of tomorrow and today, it is with deep feelings of loyality, love, and admiration for our school that I exhort you to upkeep the great traditions respect and prominence which Queen's has acquired ove rher one hundred and twenty odd years of existance. Remember that LABOR OMNIA VINCIT, and remember that a college is judged by the cultural fibre of its graduates. We have a moral obligation to our School and therefore to our country. Standing: L - R Messrs D. Locke,B.S. Chinapen, L.G. Robinson, S.M.D. Insanally, G.A. Sankies, R.M. Jonas, A. Majeed, C. Sue-Wah-singh, R.Mcdavid, M.I. Barton, L.L Rai, N.A. Robinson, C.A. Yansen (almost hidden),R.A.F. Cambridge, N.K. Robinson, M.T. Lowe, C.O. Perry, R.R. Ramdhanie. Sitting Centre: L - R Messrs C.W. Yearwood, C.I. Trotz, R.A. Bacchus, J.A. Gopaul, K. Isaacs, D. Choy, C.G. Glasgow, M.M. Drepaul, A. Persico. Sitting Front : Mrs. A Swami, Mrs. L. Harvey, Mr. E.W. London, Mr. D. Hetram (Principal), Mr. C.E. Barker (Deputy Principal), Mr. C.P. Yhap, Mr. P. Mangal, Miss A. Akai. STANDING: L - R R.B. Chan, J.D. Dennison, G.O. Richards, G.L. Richards, D.M. Bernard, L.Arno, P.D. Singh. 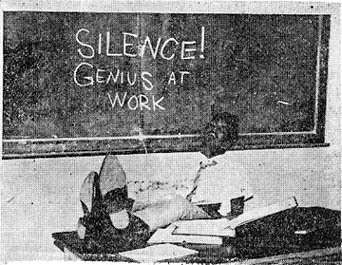 SITTING: L - R J.R. Rickford (Head of School), M.D. Hetram (Head Master), K. Gordon (Deputy Head of School), C.H.A. Denbow. XXXXXXXXXXX G. Gumbs, B.L. Moore, C.D. Meti, T.J. Akai, R. Griffith, D. Sears, H. Tihal, T. Hopkinson, C.O. Benjamin, R.A. Fletcher, E.A. Spencer, N.T. Lee, R. Narayn, J. Nunes De Souza, G.D. Gaskin, M. Hannif, G.L. Robinson, S. Nurse. Front Row L - R : B.M.B. Robertson (Business Manager),A.M. DaCosta (Features Editor), Mr. R. Ramdhanie (Supervisor), L.C. Clark (Editor), D.K. Cheddie (Sports Editor). 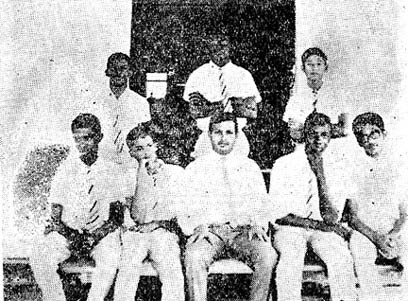 Standing L - R : D. Dewar, Gregory Gaskin. Sitting L - R : H. Gordon Watson, S.A. McIntosh, M.M. Drepaul (Editor), C. Rambarat, Lawrence Clark. 1966-67 - G.C.E. 'A'Lecel - 3 Subjects; Vice Captain Football - Nobbs House, Vice Captain Hockey - Nobbs House, School's Badminton Captain; member od School's Hockey, Table tennis, Volley ball and Football Teams; School prefect, Sportsman of the Year; Demba Scholar. 1966-67 - Secretary prefects Association; House Table Tennis Captain; House Chess Vice Captain; School Secretart of Badminton; Head Weston House; School prefect; G.C.E. 'A' Level 3 Subjects; Demba Scholar. 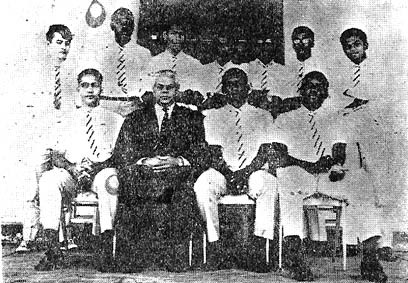 1963-64 - Vice Captain Football and Cricket (House); G.C.E. 'O' Levl. 1964-65 - Vice Captain Cricket (House); Vice Captain of Athletics (House); President of Historical Society; G.C.E. 'O' Level. 1965-66 - House Cricket captain; House Atheltics Captain. 1966-67 - Head of Percival House; School prefect; G.C.E. 'A' Levl; Distinctions in Physics, Pure Mathematics, Applied Mathematics; Guyana Scholar. 1966-67 - G.C.E. 'A' Level 3 subjects - Distinction Pure mathematics; School prefect; Deputy Head of Moulder House; School's Table Tennis Vice-Captain; Represented School in Table Tennis and Badminton. 1966-67 - House Table Tennis and Cricket captains; G.C.E. 'A' Level 3 subjects; School Prefect, C.S.M. Cadet Corps. 1966-67 - Committee Member of teh Hindu Society; Secretary of Science Society; C.S.M. (Acting) of Cadet Corps; House and School prefect - Moulder House. 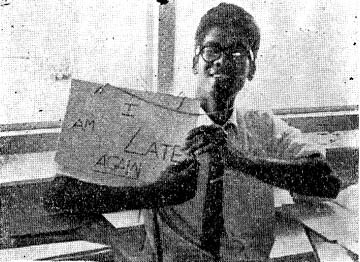 1965-66 - House Cricket Captain, House Table tennis Vice Captain; House Prefect; Member of Touring Team to Trinidad. 1966-67 - School Colours Cricket; Deputy Head of Nobbs House; G.C.E. 'A' Level 2 subjects; School Prefect; School's Cricket captain. 1965-66 - President of Pen pals Club; Drama Society; Literary and Debating Society; Editor of Lictor and Magazine; Senior Scout Patrol leader; Luckhoo Debating prize Winner. 1966-67 - G.C.E. 'A' Level 3 subjects - Distinction in English; Head of School; President of Student's Association; Regularly represented School in Debating and Drama; Austin House's Debating and Drama Captain. 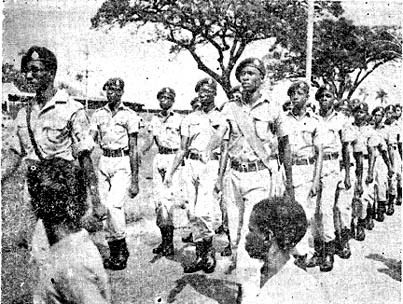 A section of the Queen's College Cadets on the march in the Independence Anniversary Celebrations. There he is - one of the usual late-comers of the school. Let's hope he'll not be late for his wedding and less yet for his death. This Upper Sixth former is perhaps in two weeks trying to do what he should have done in two years - how silly eh!.